Researchers at the University of Houston want to help you avoid lead intake from drinking water, so they’re working on an inexpensive system that turns your smartphone into a detector for the metal. Researchers built a self-contained smartphone microscope that can operate in both fluorescence and dark-field imaging modes and paired it with an inexpensive Lumina 640 smartphone with an 8-megapixel camera. Image and caption credit University of Houston. Following the Flint debacle — when insufficient water treatment capabilities flooded the city’s pipelines with contaminated water — public attention to the health risks posed by lead have soared sky-high. In a bid to protect people from events like this in the future, the team developed an inexpensive system using a smartphone and a lens made with an inkjet printer that can detect dangerously high levels of lead in tap water. Lead is quite toxic, even in small concentrations, and especially for young children. EPA guidelines state that levels under 15 parts per billion are safe to drink but, according to Shih, consumer test kits on the market today aren’t sensitive enough to accurately detect lead at that level. To address this problem, the team equipped an inexpensive smartphone with an inkjet-printed lens and, using the dark-field imaging technique, produced a system that is both portable and easy to operate. But, more to the point, the team’s rig can detect waterborne lead in concentrations as low as 5 parts per billion in tap water, and as low as 1.37 parts per billion in deionized water. The work draws heavily on a previous open-source dataset that Shih and his students published last year. That paper explained how to convert a smartphone equipped with the elastomer lens into a fluorescence microscope (and has since become the most-downloaded paper in the Biomedical Optics Express journal’s history). The present work also incorporates color analysis into the mix, which the device uses to detect lead nano-particles. As per the previously-published dataset, the team built a microscope that can operate in both fluorescence and dark-field imaging modes. They then paired it with a (relatively cheap) Lumina 640 smartphone with an 8-megapixel camera. In order to test their device, the team spiked tap water with various levels of lead — from 1.37 parts per billion to 175 parts per billion. They then added chromate ions, which react with the lead to form lead chromate nanoparticles — the latter being what the microscope actually detects. The analysis process itself is more complicated but suffice to say that by the last step of preparation, the team obtained a solid sediment that contained all the lead from their water sample. The microscopy imaging capability proved essential, Shih said, because the preparation process resulted in so little sediment that it couldn’t be imaged with an unassisted smartphone camera, making it impossible to detect relatively low levels of lead. “We wanted to be sure we could do something that would be useful from the standpoint of detecting lead at the EPA standard,” Shih said. 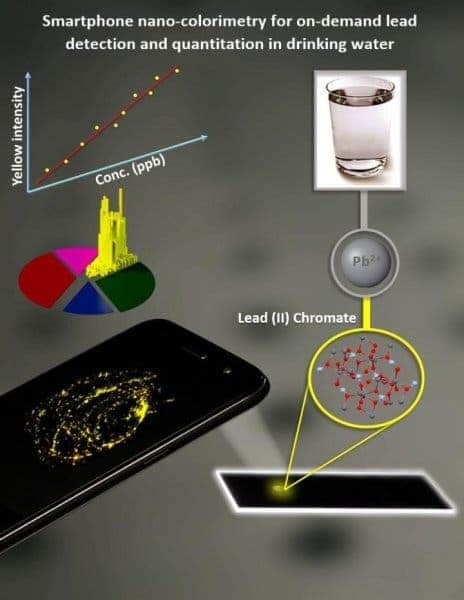 The paper “Smartphone Nanocolorimetry for On-Demand Lead Detection and Quantitation in Drinking Water” has been published in the journal Analytical Chemistry.